Being a flexi disc, a split single and featuring a demo version, this release is one of the oddest items of The Divine Comedy’s discography. 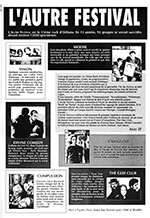 To promote The Glee Club and The Divine Comedy playing both at L’Autre Festival, in Orléans, France, in October 1993, Setanta released and distributed this promotional flexi with an early issue (#6, September 1993) of French magazine NewComer (also based in Orléans) attached to festival advert on the last cover page. However, it is likely that Setanta Records made it available by mail order along with Lucy and Indulgence No. 1. Those 7” feature two rare (at that time) tracks by those artists: a remix of a Glee Club song by par Ivo Watts-Russel (4AD label’s boss), and a demo of ‘Your Daddy’s Car’ back to 1992. This version of ‘Your Daddy’s Car’ has for a long time been a subject of interest because of its different lyrics. It was finally made available on CD within Rarities in 1999. Later, in December 1993, the record was made available with Spanish musical newspaper Spiral (issue #6, December 1993), but being a different print this time, the NewComer logo was replaced by a Spiral logo. For distribution, the record was directly stapled to the back cover of the magazine, hence all releases have a couple of holes. Since it is a flexi, both tracks are on the same side on 33RPM, so technically it is not a split single in the original meaning, but we shall admit it is still one figuratively. Near the label we can read: CAO 009 - A, which is the catalogue number for both versions.